Sahaja Yoga Tour in Georgia: It Was a Long Way (May 2010) | Realise the World! 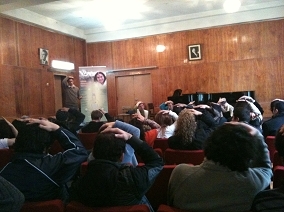 When the Tour in Armenia had been finished Sahaja Yogis from Russia went to Tbilisi, the capital of Georgia, by car. A Sahaja Yoga Tour with the participation of Sahaja Yogis from Russia and Ukraine was planned to be held there. The preparation for this Tour started long before it and was going with many obstacles: there were attempts to organize Tours in Georgia in 2007 and 2008. Negative events took place between the two brotherly nations during the previous years. Those events even led to war in August 2008. It brought much suffering to both the nations and did much harm to the relations between the countries. Love and compassion of Sahaja Yogis should help heal the received wounds. 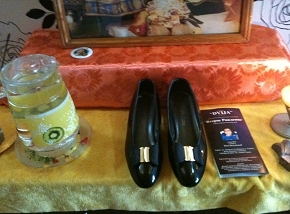 The Coordinator of Russia handed the shoes of Shri Mataji for Georgia to Sahaja Yogis of this country. It was a touching and symbolic moment expressing great love and compassion our Mother teaches us. We believe that our brotherly nations will find ways to each other’s hearts and the relations between the countries will be based on love and mutual understanding. Sahaja Yogis should show people the example of the relationship based on love and compassion. At the beginning of the Tour there was offered a havan to remove all the negativity which inflames international enmity and leads to wars. The Tour in Georgia was a real example of bringing people together through the cleaning and soothing message of Sahaja Yoga. Our Georgian brothers and sisters were taking care of Russian and Ukrainian Sahaja Yogis all that time expressing great love. Again and again we thank our Divine Mother for the blessings She bestows upon us.